Pick the right ceiling fan size for your room. Size is important. If your ceiling fan is too small for your room, it won’t move air efficiently or effectively. If it’s too big, it could create the feeling of being in a wind tunnel. Room size is the main factor for determining what size ceiling fan you need, although ceiling height can affect it as well. (With taller ceilings, you may want to size up or use multiple fans, as the fan will need to circulate more air.) The following ceiling fan size guide from the American Lighting Association can help you determine which size is right for you. How to measure a ceiling fan: Ceiling fan measurements come from their blade span, which is the diameter of the circle their spinning blades create, also called their “sweep.” For a ceiling fan with an even number of blades, measure the fan’s diameter to determine its span. For a ceiling fan with an odd number of blades, measure from the center of the fan to the end of a blade, and multiply by two. It’s important to remember that these size guides are suggestions. “Aesthetics and homeowner preference play a big role in using these guidelines,” says Allyson Mokhtarei, owner of Alcott & Bentley, a lighting and ceiling fan showroom in Louisville, Kentucky. “Some of today’s industrial multiblade fans have an oversized look, at 84 to 99 inches across, which is bigger than average,” says Caroline Halcovich, president of The Light House, a lighting and ceiling fan showroom in Palm Desert, California. Their style and airflow make them very popular. Consider the number and angle of the blades. With today’s models, there isn’t necessarily a right number of blades for a ceiling fan. It’s more of an aesthetic preference than a practical one. When it comes to airflow, the motor and the blade pitch are most important. The American Lighting Association recommends a 12- to 15-degree blade pitch for optimum air movement, although plenty of companies offer ceiling fans with steeper blade angles. “The steeper the pitch, the more air the fan can churn, like a mixer or blender,” Halcovich says. Get the height right. 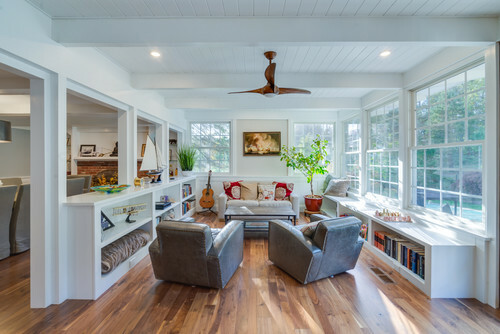 In general, experts say ceiling fans are at an optimal height for air movement when they are 8 to 9 feet above the ground (and at least 12 to 18 inches from the nearest wall). They can be higher, but the blades shouldn’t be less than 7 feet above the ground, for safety. Personal preference, in addition to ceiling height and slope, can affect the mounting type you choose for your ceiling fan. Ceiling fans for low ceilings. For ceilings less than 8 feet tall, choose a hugger or flush-mount ceiling fan. These fans mount next to the ceiling and help maintain the recommended minimum 7-foot clearance between ceiling and floor. Ceiling fans for standard-height ceilings. If the ceiling in your room is about 8 to 9 feet tall, you can most likely use the standard 3- to 5-inch long downrod, the pipe that connects the ceiling fan to the ceiling mounting and that comes with the fan. Ceiling fans for high ceilings. In high-ceiling rooms, longer downrods can bring the fan closer to the optimum hanging height. These extended rods sometimes come with the fan itself or are sold in kits. Lengths range from several inches to several feet. As the downrod gets toward the longer end of the spectrum, the potential for the ceiling fan to wobble increases. In the case of extra-high ceilings, you might choose to have multiple ceiling fans or to go with a larger fan. Ceiling fans for vaulted ceilings. Most ceiling fans can hang from sloped or vaulted ceilings that are less than 21 degrees, Mokhtarei says. Attachment kits can be bought for fans hanging on slopes that are steeper.Buy a high-quality motor. A ceiling fan is a hardworking household appliance, and choosing one that will last starts with what’s inside. This is especially important for ceiling fans that will be used often and for hours at a time, such as in bedrooms or living rooms. “Buyers need a high-quality motor with a reverse feature for year-round air circulation,” Mokhtarei says, as well as a limited lifetime warranty. She adds that the answers to her clients’ most common questions — will the ceiling fan wobble, make noise, actually move air? — lie in the fan’s motor. “A good fan will be well-balanced and will not wobble or make noise, even after decades of use,” she says. Mokhtarei and Halcovich both recommend buying a ceiling fan with a DC motor. “These motors use 70 percent less electricity than standard AC motors,” Mokhtarei says. They are quiet, often feature more speed options, have a reverse function on the remote and are generally faster to start, stop and change speed. “These small motors allow for a small fan body but tremendous power,” Halcovich says. Controls. Although ceiling cord pulls are still an option, wall-mounted or remote controls for ceiling fans have become mainstay features — in some instances, you don’t even need additional wiring for wall controls. “Many modern wall controls work via radio frequency, rather than being hard-wired, so they actually function like a remote control in your wall,” Mokhtarei says. Newer systems even use bluetooth technology, so fans can be controlled by an app on your phone.Outdoor ceiling fans. Ceiling fans are great additions to outdoor spaces as well, providing a cooling breeze in the heat of summer. When shopping for fans, you’ll see that they are rated to withstand dry, damp or wet conditions. For an outdoor space, such as under a porch or pergola, a ceiling fan that is rated for wet conditions is necessary. “Wet location fans can actually sit in the rain or get hosed off, since they are fully contained and their blades won’t warp or get damaged from the sun,” Halcovich says. Ceiling fans rated for damp conditions can be used in bathrooms, carports or anywhere that may have moisture but no direct contact with water or the elements. You don’t want to use a ceiling fan rated for damp conditions outside. Installing your ceiling fan. Although a handy homeowner can probably swap out an old ceiling fan for a new one, working with a licensed electrician (one who specializes in fan installations) is always a good idea — especially if any new wiring needs to be done.